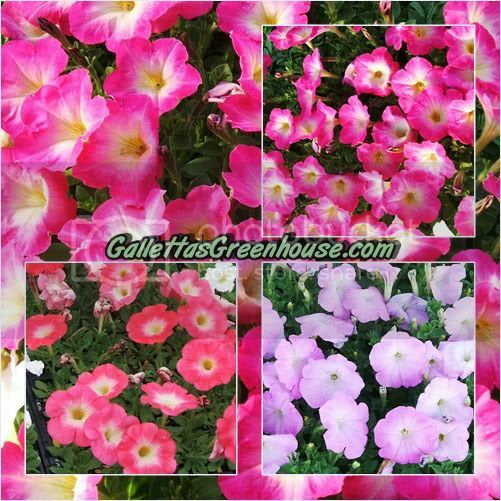 Petunia | Galletta's Greenhouses of Oswego, NY - "Our Heart is in Every Flower"
Galletta's has, for years, grown a large amount of beautiful petunias as one of the staples of our stock. 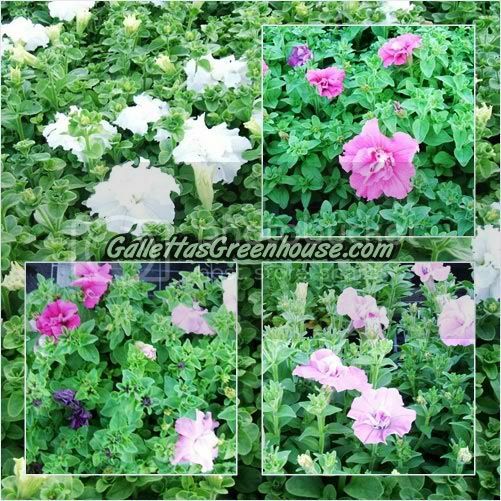 With their colorful trumpet-shaped flowers, branching foliage, and prolific blooms of just about every color but black and blue, Petunias are one of the most popular bedding flowers. 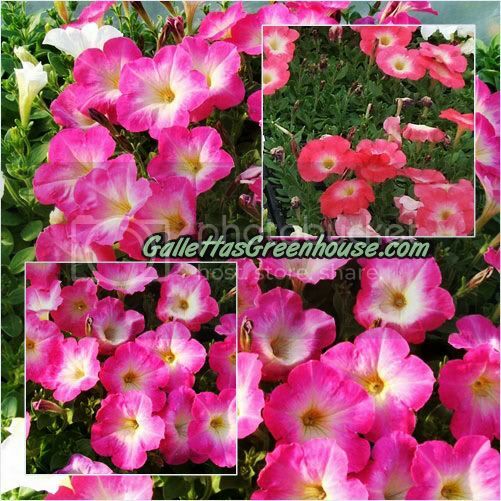 Petunias are native to Argentina, and enjoy full sun to partial shade. A large variety is what makes them so versatile, with single and double blooms, petals that can be either smooth or ruffled, colors that can be solid, striped or veined, mounding and cascading habits and even a gentle fragrance. Although some forms require deadheading to keep them going, most varieties will bloom throughout the summer. Be careful of watering the blooms directly, as this often ruins the petals and turns them into mush. Remove the mushy flower petals beneath the heads to encourage new growth. 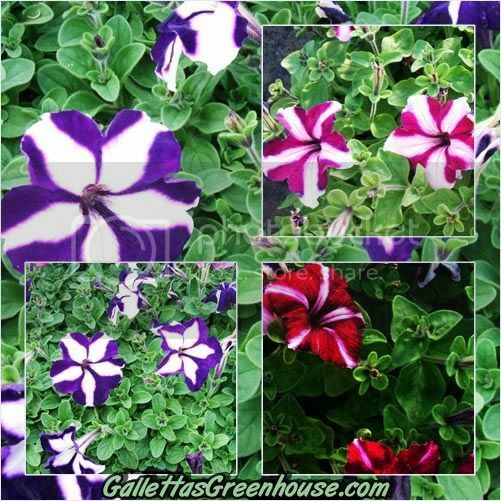 You can now find petunias with growing habits that mound in borders or trail down containers. 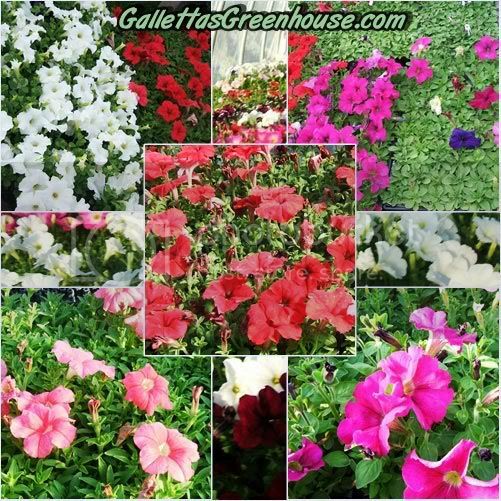 Galletta's sells many varieties! 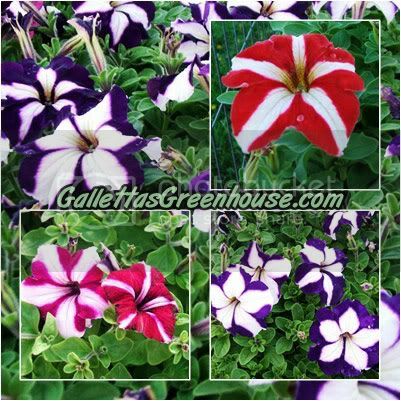 Petunia plants should be carefully transplanted when set outdoors, and only do so after all danger of frost is past and when the soil temperature has reached at least 60 degrees F. Plant the transplants at the same depth they were growing in the containers, and try not to disrupt the soil or the roots much while doing so. Water thoroughly after transplanting to avoid excessive wilting. A soil ridge around the plant will help hold water in the vicinity of the plant. Plant on a cloudy day if possible, and try not to do so during hot or windy weather. 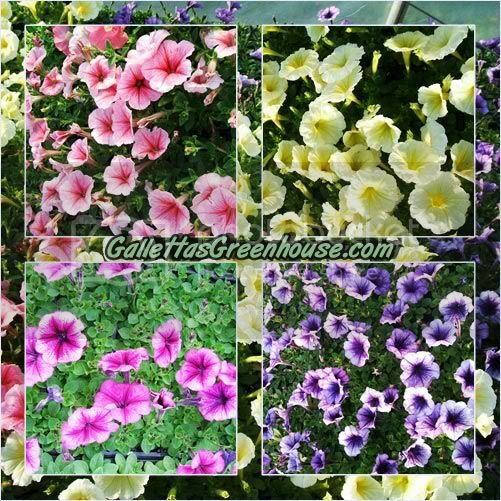 Petunias do best in full sun, although they will tolerate several hours of light shade a day. Fertilize but be mindful that too much fertilizer can cause excessive vegetative growth and sparse flowers. In high pH soils (alkaline soils) additional iron or iron sulfate may be beneficial to reduce yellowing of the foliage. Water to a depth of six to eight inches when the soil becomes dry. The frequency of watering will depend on the type of soil, weather conditions and the amount of mulch. Do not allow the soil around the plants to remain excessively wet for several days, as this can lead to stunted, chlorotic growth or disease. "Pinching" the plants can be used to increase the number of flowering stems and discourage excessive vegetative growth. Remove old flowers (dead heads) beneath the head when they start to fade to encourage repeat blooming. When the plants get too lanky or stringy for your tastes, you can cut them back considerably. 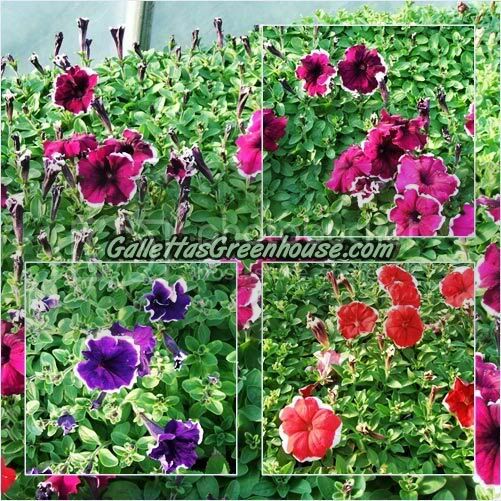 With proper watering and fertilization, they can grow back as beautiful as before in a relatively short amount of time. 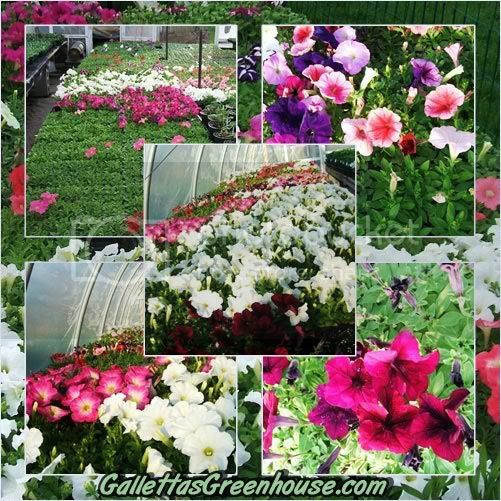 Petunias have relatively few problems with insects and disease, and provide you with beautiful color all summer long! Come back later for more information! And don't forget to comment!